Ageing is wrongly associated with decline, when in reality it just means we have to work that bit harder to look after ourselves. As we age it’s important that we exercise regularly, look after our nutrition and stay active within the community and our social network. The longer we neglect any of these areas of our life the more difficult it can be to resume a more active lifestyle, but it is never too late to change bad habits! Exercising daily and remaining physically active is what helps us to retain our independence and which can ultimately enable us to live on our own terms. The World Health Organisation encourages up to 300 minutes of moderate-intensity aerobic physical activity or 150 minutes of vigorous-intensity aerobic physical activity per week. That may sound like a lot but it’s just half an hour, 5 days a week. Such targets can be achieved through moderate physical activity, such as walking while participation in a more vigorous exercise programme may be another person’s desired method of physical activity. As we age, resistance or weight bearing exercises are particularly beneficial in targeting muscle wastage and maintaining bone density and strength. 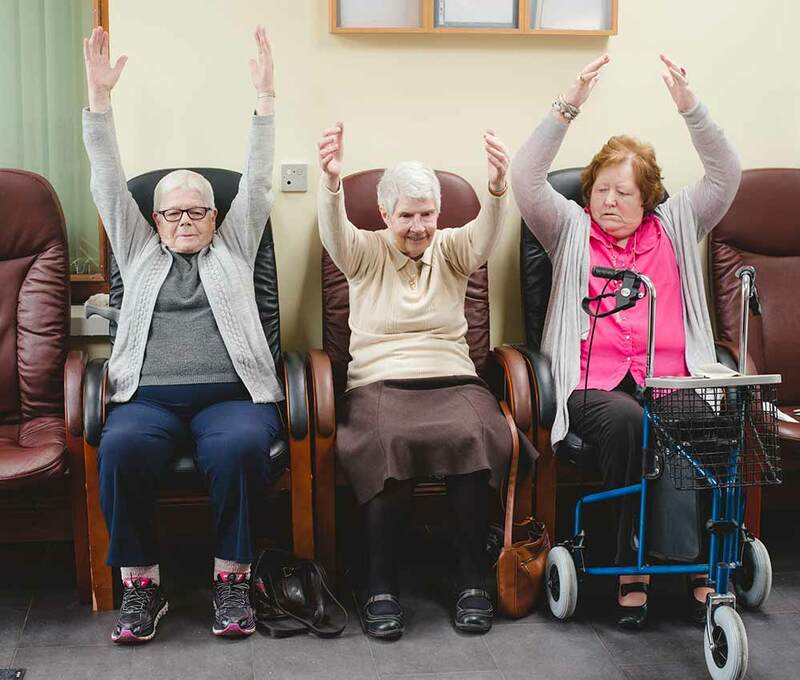 No one mode of physical activity is right or wrong – the key is to find a form of physical activity that you enjoy enough to keep doing, whilst targeting key areas associated with age related decline. That means including flexibility (stretching), endurance, strength, and balance exercises in our routine. As we age and become less active our metabolism slows and our energy output decreases. As outlined by the Institute of Medicine our body’s ability to process and utilise the nutrients we need to maintain healthy bones and to prevent muscle wastage decreases. This means that we may in fact need to boost the amount of nutrients and minerals we are absorbing into our body. Muscle wastage and loss of bone density (osteoporosis) can ultimately contribute to falls and loss of mobility and independence. From the age of 60 around one third of women and two thirds of men will have reduced muscle mass. In practical terms what we must do is ensure that our food intake matches our output. Our daily activity levels will often drop as we age and live a more sedentary lifestyle, but portion sizes remain the same. More importantly though is the content of what we choose to eat. We must follow balanced and varied diets containing fresh fruit and vegetables for fibre, protein rich foods which can maintain muscle mass and bone strength, dairy, healthy oils, whole grain foods and plenty of fluids all of which provide essential nutrients and minerals to our bodies. Finally we must remain active within our community and social circles. Social isolation can be hugely damaging to our psychological health and as we age and it’s important that we have a support network around us. People are living longer but in smaller family networks and in a society that isn’t as familiar with its neighbours. Increasingly studies are identifying a correlation between a lack of social engagement and the development of heart disease and other medical conditions aside from more obvious negative effects such as depression and anxiety. That is why we should get active, get out and about in our local community. We have nothing to lose but everything to gain! Why not try a community class in your area or contact us about a one to one class.